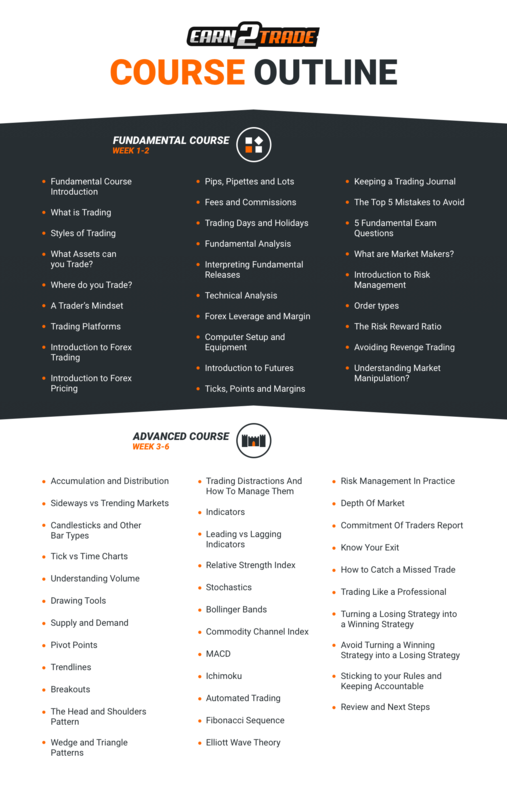 A catalog of content rich presentations diving deep into more specific topics geared towards advanced traders. The Beginner Crash Course is a course of 60 six – ten minute videos that cover both the basic and the advanced concepts necessary for trading. Each video is followed up with a quiz that tests the students retention of video. It is an entry level education course that teaches students about the market and general market conditions, risk management and technical trading. The lessons are designed to deliver complex concepts in an easy-to-understand format, and are heavily animated with plenty of simple examples. We offer lifetime access to the lessons at an affordable cost. What’s the outcome of taking this course? You will be competent in the basics of trading, how exchanges and brokerages work, what you can trade, how to read charts, identify chart formations, make educated predictions on how prices move and be able to place trades on your own. Our education package is designed to take on any beginner with no knowledge at all and teach them how to trade Forex and Futures independently. How much does the Beginner Crash Course cost? It’s either $449 for a one-time purchase, or $79 per month (you can cancel your subscription any time). How long will I be able to access the lessons? If you purchase the package in one installment, you get lifetime access to the content. Lifetime access can be cancelled if we see no activity (logging in) for four consecutive months. Our Fundamentals course will bring you from zero or limited knowledge, to a solid understanding of the basics of the Futures and Forex markets. The most rudimentary material is covered in the first 21 Lessons. The rest of the lessons in the Fundamentals course will focus on Intermediate level knowledge. After mastering the basics you will want every tool and strategy at your disposal. Our Advanced course is designed to build upon the Fundamentals by moving into practical trading and technical analysis. By the end of the course, you will have a thorough understanding of its ins and outs, and you will be ready to trade extensively. Enroll now to our comprehensive education course and take your first steps toward becoming a professional trader!